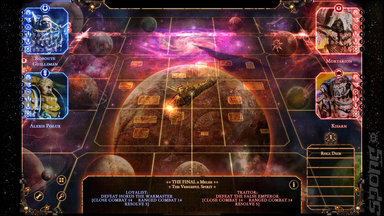 The board game Talisman has been in existence in some form or another for over 30 years, so it should come as little surprise to see it appear in a digital form on both computer and tablet formats. Talisman Horus Heresy is the second digital version of the much celebrated board game and Chris caught up with its maker, Nomad Games, to chat about it in this video edition of The Sausage Factory. Talisman is also the first game show host Chris ORegan played that wasn't Monopoly and so began his long held affection for board games that are now the mainstay of Board Game Geek. This affection was also held by Andy Bate, the Art Director at Nomad Games the makers of Talisman Horus Heresy. Chris and Andy speak about the game along with the many changes to the video game industry Andy has witness and lived through during his long tenure in it.